We compared changes in performance and total haemoglobin mass (tHb) of elite swimmers in the weeks following either Classic or Live High:Train Low (LHTL) altitude training. Twenty-six elite swimmers (15 male, 11 female, 21.4 ± 2.7 years; mean ± SD) were divided into two groups for 3 weeks of either Classic or LHTL altitude training. Swimming performances over 100 or 200 m were assessed before altitude, then 1, 7, 14 and 28 days after returning to sea-level. Total haemoglobin mass was measured twice before altitude, then 1 and 14 days after return to sea-level. Changes in swimming performance in the first week after Classic and LHTL were compared against those of Race Control (n = 11), a group of elite swimmers who did not complete altitude training. In addition, a season-long comparison of swimming performance between altitude and non-altitude groups was undertaken to compare the progression of performances over the course of a competitive season. Regardless of altitude training modality, swimming performances were substantially slower 1 day (Classic 1.4 ± 1.3% and LHTL 1.6 ± 1.6%; mean ± 90% confidence limits) and 7 days (0.9 ± 1.0% and 1.9 ± 1.1%) after altitude compared to Race Control. In both groups, performances 14 and 28 days after altitude were not different from pre-altitude. The season-long comparison indicated that no clear advantage was obtained by swimmers who completed altitude training. Both Classic and LHTL elicited ~4% increases in tHb. 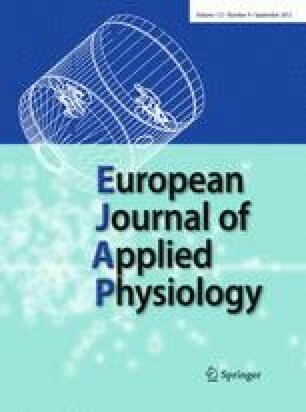 Although altitude training induced erythropoeisis, this physiological adaptation did not transfer directly into improved competitive performance in elite swimmers. The authors wish to thank all the swimmers and coaches who took part in this project. We are grateful for the contributions of Prof. Walter Schmidt and Christian Voelzke, from the University of Beyreuth, and Dr Chris Baldi, from the University of Northern Arizona. This project was collectively funded by the Australian Institute of Sport general and collaborative research fund, the Australian Institute of Sport Swimming program, and the Federal Institute of Sport Science, Germany.